Warm, moderate-output humbucker. Great for jazz, blues, classic rock and slide. 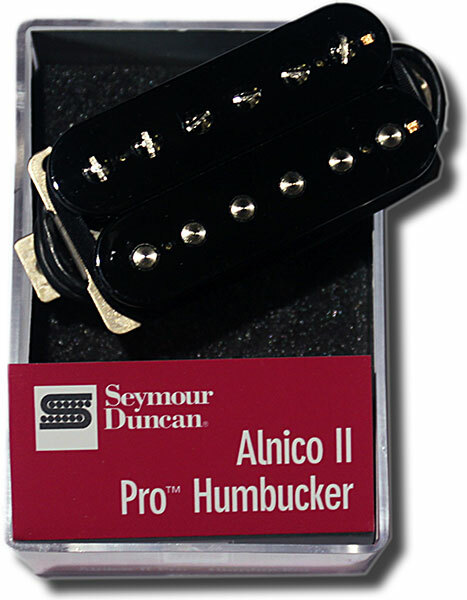 The Alnico 2 magnet and moderate windings yield a warm, sweet tone with more natural string vibration for great sustain. Classic rock players who get their distortion from the amp rather than the pickup love theAPH-1. It allows them to back off the crunch and get beautiful clean tones with softer attack. Compared to the '59, the Alnico II Pro has a rounder sound with a spongier bass response. Comes with four-conductor hookup cable and no logo. Often the APH-1 is used in both neck and bridge positions, eg Slash. Or, in the neck with a higher output pickup like an SH-11 Custom Custom or SHPG-1b Pearly Gates for heavier rock or hotter blues sounds from the bridge position. For brighter toned instruments. Works especially well with maple and ebony fingerboards. Also works great with hollow and semi-hollow body guitars. Options of Nickel or gold-plated cover, Trembucker version.